Feme: Managing a transboundary fishery in the Amazon: The ornamental silver arawana case. Managing a transboundary fishery in the Amazon: The ornamental silver arawana case. The Amazon basin is home for the silver arawana (Osteoglossum bicirrhosum), a fish better known in the international aquarium business as the “dragon fish” due to its phenotypic characteristics that makes it resemble a Chinese dragon, which has turned it into a highly popular pet in Asian countries. In such countries, this fish is believed to bring good luck and prosperity. Although not famous for its good looks, it is still an interesting fish that presents parental care by the male. At the tripoint where the borders of Colombia, Brazil and Peru meet in northwestern Amazonia, the ornamental fishing of the silver arawana is a highly important economic activity for many riverine communities of the three countries. However, the management policies vary greatly between countries to the point where what Brazil implements is exactly the opposite of what the others do. In Brazil its ornamental fishery is forbidden in order to protect its stocks, but the adults can be exploited by the commercial fishery for consumption. It is a large fish (up to 1 m) and widely appreciated in the Brazilian Amazon diet. In fact, the silver arawana is the third species (in biomass) landed in Tefé, a Brazilian town near (~600 km) the study sites, where its demand keeps growing. On the other hand, Colombia and Peru legally permits the silver arawana live exploitation at the fish larval stage (3-5 cm) for the aquarium trade millionaire business. These countries regulate the ornamental fishery by imposing closed seasons (Colombia also imposes a quota). It does not mean though that Colombia and Peru actually sit down to agree on dates and areas to be closed; they make their decisions without talking to each other. In common, however, we have that both countries chose to ignore the recommendations done by researchers on the best period to close the fishing in order to protect the reproductive period of the species. Instead, they established closed periods that satisfy the market stakeholders’ (middlemen and exporters) interest. What is already bad gets worse when fishers and middlemen disrespect an already inappropriate closed season, which is easy to do under institutional weakness. In a region where countries boundaries are not more than an abstract concept for people and for the fish they depend upon, it is easy to imagine that larval fish are also illegally collected in Brazil. In 2014, for instance, around 17% of the fish gathered by one of the study sites in Colombia (the middle Putumayo-Iça river) came from Brazilian grounds. Brazilian farmers open lakes that are inside their properties to Colombian fishers for an average of USD 4,400. In return, a lake can yield up to 30,000 silver arawana larvae worth more than USD 13,300. Where poverty reigns, such easy profits are hard to pass. Of the total volume of fish caught in Colombia or Brazil, 17% were marketed by Peruvian (illegally) and 83% by Colombian middlemen to the export firms of each country respectively. We can all see that managing this fishery is a herculean task because of its high profitability and the fact that it is performed in the middle of a very isolated region. However, it would be helpful if countries could talk for once and agree on their best policies, ideally considering the results provided by research. Countries and their managers would do even better if they could also address the consumer markets, namely the United States, Asia and Europe. One recommendation would be to call for the importing countries and regions to demand that the exporting ones comply with national and international laws, regulations and advice on fishery sustainability. One way to do that would be do demand fish traceability, where we could know if the fish are being harvested with environmentally friendly methods and subjected to better post-capture practices that decrease mortality rates. No obstacle should be used as an excuse to not move towards an integrative management approach, under shared monitoring programs, management and market goals. Perhaps, existent programs, such as the Amazon Cooperation Treaty of 1978, can be used as a kick start to get the ball rolling. Who knows, maybe this fish will be the key to unlock a true dialogue about sustainability in South America. Maldonado et al. 2017. 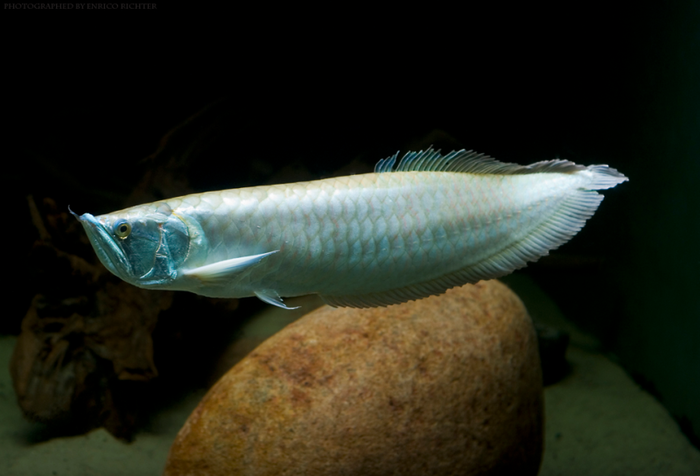 Transboundary fisheries management in the Amazon: Assessing current policies for the management of the ornamental silver arawana (Osteoglossum bicirrhosum). Marine Policy 76: 192-199.